The Department of Communication Sciences and Disorders has grown and progressed continually since beginning in 1966 as a Division of Speech and Hearing in the Department of Speech and Theater. It was at that time that Godfrey E. Arnold, M.D., Donald McBryde, Ph.D., and James Mann, Ed.D. wrote a program development grant and received $20,000 from the United States Office of Education for faculty support and student stipends. Mr. Ralph Frybarger came from the directorship of the Speech and Hearing Clinic at Mississippi State College for Women to become the Director of the division, and Mrs. Gloria Dodwell Kellum came from Louisiana State University to become associate director. Five students were enrolled in the program, which was located in the Fine Arts Center. By 1967 there were twenty-five baccalaureate students majoring in speech therapy. The designation for the major was either in special education with emphasis in speech therapy through the School of Education or in speech therapy with a minor in an area chosen by the student in the College of Liberal Arts. In 1968, Dr. John Wingo replaced Mr. Frybarger as Chairman of the Speech and Hearing Division. The faculty included three full-time instructors and one part-time instructor. In addition to Dr. Wingo were Mr. Calvin Dubose, Mrs. Gloria Dodwell Kellum, and Mrs. Vicki Wingo. The year began with forty majors. In the spring, the location for the Speech and Hearing Center changed from the Fine Arts Center to the Reading Services Center in the Education Building where it remained for one year. 1969, a graduate program in speech pathology and audiology was initiated with concentration on professional preparation through academic and clinical training. One student enrolled in the graduate program, while the number of undergraduate majors in communicative disorders increased to seventy-five. Dr. Nels Beck and Dr. Jane May were new additions to the faculty. In January of 1970, the program was moved to University House, and in the spring of that same year, departmental status was granted. In the fall of 1970, Dr. Hugh Bateman became Coordinator of Clinical Services, and Mrs. Millie Quarterman was added as a replacement position. By that time the number of full-time graduate students had increased to six and there were many part-time graduate students as well. Dr. Bateman was appointed as acting chairman for the 1971-72 year. Ms. Charlene Bullock filled a replacement position, and Dr. Jerry Punch was added in audiology, bringing the number of faculty members to six. Program energy was spent building clinical services and the graduate training program which included fifteen full-time students. In 1972 Dr. Thomas J. Wentland became Chairman of the Department of Communicative Disorders. The number of undergraduate and graduate students increased to 100 and 20, respectively. In June of 1973, the Department of Communicative Disorders was transferred from University House to George Hall, previously a men’s dormitory which had been renovated for the purpose of providing a location for all departmental activities. In the fall of 1973, there were seven faculty members with Mr. Harold Meyers and Mr. Bruce Plakke as replacement positions and Mrs. Phyllis Goodwin as an addition for clinical supervision. One hundred undergraduates were enrolled as well as twenty-nine full-time graduate students. During the academic year of 1973-74 and continuing until 1975-76, the department benefited from federal grants to support personnel preparation. While student enrollment continued to climb, the University of Mississippi became largely responsible for the dramatic increase of speech and language clinicians employed in the public schools in North Mississippi. Mrs. Julie Walton and Dr. Margaret Wylde joined the faculty in 1975, and Mrs. Sue Hale and Ms. Christine Sleight became a part of the faculty in 1976. Mrs. Evelyn Costantino was employed as a part-time instructor in speech-language pathology. Dr. Thomas Crowe joined the University faculty as an assistant professor in 1977. In the fall of 1979, other additions were made to the faculty. Ms. Leah Lorendo filled a replacement position as an instructor. Dr. Subhash Bhatnager was added as an assistant professor. Dr. Jerome Alpiner was chair of the department at this time and Drs. Paul and Carol Waryas joined the faculty. Also in 1979, the Educational Training Board site visit to the program resulted in academic accreditation in Spring, 1979. Dr. Thomas A. Fields was hired to develop and manage the Jackson aspect of the academic program in 1980. A preschool deaf education class under the supervision of Ms. Beverly Hunter added a new clinical component in the fall of 1981. Dr. Caslov Pavlovic an audiologist/hearing scientist and Dr. Peggy McCardle, a linguist/child language specialist joined the faculty in 1982. Ms. Linda Redmond was employed as the teacher for a new departmental preschool speech-language program. Ms. Becca Brooks became an instructor in audiology. Dr. Hugh Bateman became chair of the program following Dr. Alpiner’s departure, but he was transferred to the Dean’s office after one year. During Dr. Bateman’s year as chair, Mrs. Julie Walton became clinic director. Dr. Gloria Kellum became acting chair while the department conducted a national search for a new chair. During the summer, 1984, Dr. John T. Jacobson, an audiologist, assumed the position of Department Chair. During the Fall of 1984, Florence Davenport joined the faculty as an instructor in audiology. Judy West became a grant coordinator for a personnel preparation grant awarded to Dr. Crowe through the U.S. Department of Education. In 1985 Beverly Hunter and Linda Redmond left the university as did Dr. Pavlovic. Mrs. Sue Rose became the preschool speech-language instructor, and the preschool hearing impaired class was discontinued. Dr. Kellum became the Director of Clinical Services when Mrs. Walton asked to return to full-time teaching. In 1986, Dr. Jacobson, Mrs. Costantino, Ms. Brooks, Ms. Rose, and Dr. Bhatnagar left the University. Dr. Thomas Crowe was appointed Acting Chair of the department, a position which was made permanent the following year. Ms. Virginia Nason replaced Sue Rose as the instructor of the preschool, and the preschool was expanded to include hearing impaired youngsters during this time. In 1987 Dr. Crowe was able to replace faculty members lost to attrition and budget cutbacks. Dr. Patricia Jackson was hired as an assistant professor in audiology, and a second preschool teacher was hired, Connie Atkinson. In December 1987, Ms. Davenport left for an industrial audiology position, and Kimberly Parker Bright replaced her. Dr. Julie Masterson was hired as a language specialist. Dr. Ray Hoops, who became the Vice Chancellor for Academic Affairs, was appointed as Professor of Communicative Disorders. When Leah Lorendo left in 1988, a search was begun for an audiology faculty member, and Lisa Lucks Mendel joined the faculty in 1989. Kimberly Parker Bright relocated to New York with her husband, and Florence Davenport returned to that position. Ms. Jan Shook replaced Virginia Nason in the departmental preschool program. Julie Walton went on leave of absence in 1990-91 to complete her Ph.D. Dr. Marie Byrne joined the faculty on a temporary appointment to fill Dr. Walton’s teaching duties. 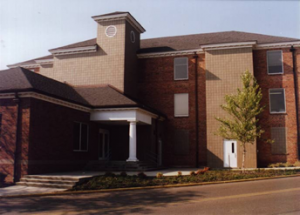 In December, 1990, the department was temporarily relocated to Hill Hall while major renovations occurred at George Hall. During the two-year relocation, Dr. Masterson left the program and was replaced by Dr. Byrne. Ms. Davenport left and was replaced by Ms. Cheryl Taylor. Ms. Hale became the Director of Clinical Services. The faculty and students returned to George Hall in May, 1993. At the time approximately 40 graduate students and 100 undergraduate majors were enrolled. In July, 1993, Ms. Taylor resigned her position. Ms. Vicki Gaillard filled it temporarily until January, 1994, when Lara DiLollo accepted the position. Ms. Gaillard continued in the department on a part-time basis. In the fall of 1993, Ms. Lennette J. Ivy became an instructor in speech-language pathology in a newly created position. The re-dedication of George hall and its official re-opening was held in March, 1994, with Dr. Jeri Logemann, president of the American Speech-Language-Hearing Association, as the keynote speaker. Ms. Shook resigned from the preschool instructor’s position, and changes in state budgeting for university preschool programs caused the elimination of the preschool classroom in the fall of 1994. Dr. Christine Eubanks join the program as an assistant professor of Audiology in 1994, and remained with the department until 1997. Also in the fall of 1994, Dr. Kellum was appointed Director of the Sesquicentennial, which ultimately resulted in her transferring from the primary duties in the department to full-time administration in the University. Ms. Laura Valentine, and later, Ms. Karen Vernon, filled Dr. Kellum’s supervisory roles while Dr. Byrne divided her time with Mississippi University for Women and taught for Dr. Kellum. With an increase in departmental budget, the departure of Dr. Byrne, and the appointment of Dr. Kellum to full-time administration, Dr. Merlin Taylor and Dr. Lea Helen Evans joined the graduate faculty. Dr. Richard Roberts was employed as an assistant professor of Audiology. In the fall of 1997, Ms. Lennette Ivy went on administrative leave to work on a Ph.D. at the University of Memphis. In the interim, Mr. Tony DiLollo filled Ms. Ivy’s supervisor and teaching duties. Dr. Kellum was appointed as the Vice Chancellor for University Relations but continued to teach a workshop for the department on a limited basis. A new instructor’s position was created in the fall of 1999, and Virginia Wiggins was appointed to supervise clinical activities. In the year 2000, Dr. Lea Helen Evans, Dr. Merlin Taylor, Mrs. Sue Hale, and Mr. Tony DiLollo left the University. Joining the Department in the new academic year were Dr. Carolyn Wiles Higdon, assistant professor, Ms. Stephanie Joyce and Mrs. Tracy Acevedo, instructors and supervisors of speech-language pathology, and Mrs. Teresa Douglas, clinical audiologist. In addition, Mrs. Lennette Ivy returned from administrative leave and Mrs. Lara DiLollo was appointed Director of Clinical Services. The department relocated to a new academic home in the year 2001, leaving the College of Liberal Arts and moving to the newly created School of Applied Sciences. Joining the department in this new school were the departments of Social Work, Health, Exercise Science and Recreation Management, Family and Consumer Science and Court Reporting. Dr. Crowe was appointed Interim Dean of the school while he continued to chair the department. With the upcoming certification changes in audiology requiring a doctoral degree for entry into the profession, the decision was made to suspend enrollment in the audiology graduate program beginning with the 2001-02 academic year. In that same year, Dr. Julie Walton retired from the University after 26 years. Also leaving the University were Dr. Lisa Mendel, Dr. Richard Roberts, and Mrs. Teresa Douglas. In addition, Mrs. Tracy Acevedo changed from full-time to part-time duties. Joining the department were Mr. Tony DiLollo, assistant professor in speech-language pathology and Mrs. Rebecca Lowe and Mrs. Maggie Ellard, instructors in audiology. The year 2002 brought with it more changes for the department. After 25 years of service to the department and the University, Dr. Thomas Crowe retired and was awarded Professor Emeritus status in the department while Dr. Carolyn Higdon was appointed Interim Chair of the department. Dr. Tony DiLollo completed his Ph.D. at the University of Memphis while Lennette Ivy, Lara DiLollo, and Rebecca Lowe continued work on their doctoral degrees. Joining the faculty this year were three part-time instructors, Mrs. Judy Newton, Speech-language pathologist, and two audiologists, Mrs. Holley-Marie Biggs and Mrs. Susan Lopez. Throughout the changes, the growth of the department remained positive. New clinical programs and training sites were added. The goals of the department continue to be education, service, and science. During the year 2003-2004, the Department of Communicative Disorders received re-accreditation from the Council of Academic Programs through the American Speech-Language Hearing Association (ASHA). The re-accreditation covered the next ten years with annual updated reports to ASHA. The Department received the maximum amount of re-accreditation time, thanks to the hard work of every faculty and staff member in the Department. During this year, Anthony and Lara DiLollo left the Department for new positions at Wichita State. Virginia Wiggins, Stephanie Beebe, and Judy Newton left their positions to return to work in the public school systems. Alice Henton, Janet King, Larry Higdon and Gina Keene joined the Department as part-time clinical supervisors. The graduate program had 30 first and second year graduate students. The Early Intervention Grant (state grant) was continued, and the Department received grant monies to develop an electronic supervision system connecting all offices, classrooms and clinic treatment rooms for teaching and treatment purposes. The Department also received $25,000 from the Office of the Provost to upgrade the speech science laboratory. Dr. Paul Miller joined the faculty and Dr. Thomas Crowe retired as Dean Emeritus of the School of Applied Sciences. Dr. Crowe continued to teach each semester in the Department until December 2005. Larry Higdon was President of ASHA during 2004 bringing additional national attention to the Department. The academic year of 2004 and 2005 brought many changes. The Audiology Clinic upgraded the assessment technology as well as participated in a hearing aid buying service, and developing a 3-5 year marketing and business plan. Ms. Melanie Randle join the department as a clinical audiologist. The Speech and Language Clinic developed off-campus clinical sites, participated in Camp Jabberjaw in Starkville, MS and began a summer camp program for children with speech and language disorders in addition to the more traditional clinic during the academic year. Practicum became a graded course for the graduate students with a well-divided pediatric and adult clinical program. Involvement with the University of Mississippi Medical Center increased to weekly participation this year. The CD Handband performed at the national ASHA meeting in Philadelphia, PA in November 2004. All tenure-tract faculty presented papers at ASHA 2004 and many at MSHA 2005. Lennette J. Ivy, PhD, completed her doctoral degree from The University of Memphis, Christy Coker and Alice Henton joined the Department as full time clinical supervisors. Mrs. Henton also assumed the responsibilities of Assistant Clinic Director for the Speech and Hearing Clinic. Gina Keene came on faculty as a salaried part time clinical supervisor and instructor. The graduate students attended ASHA 2004 in Philadelphia, PA (November 2004), the Mississippi Speech and Hearing Conference in Jackson, MS (April 2005), and the National ASHA Schools Conference in Indianapolis, IN (July 2005). In August of the 2005-2006 academic year Greg Snyder, PhD and Laura “Lollie” Vaughan, PhD joined the faculty ranks of the department. Also, Mr. Brad Crowe joined the Speech and Hearing Center as a part-time clinical supervisor. In September 2007, Dr. Lennette J. Ivy began serving as Interim Department Chair, while a national search for a new department chair was underway. During that year, Anne Williams, AuD, joined the department as clinical audiologist. In 2008, the department was officially renamed The Department of Communication Sciences and Disorders. This change was deemed necessary to reflect the evidence-based foundation of the professions of audiology and speech-language pathology. During the spring of 2008, Rebecca Lowe received her AuD from Central Michigan University and Brad Crowe joined the department full-time, as an instructor/speech-language pathology supervisor. In the summer 2008, Alice Henton and Gina Keene resigned from university. Brad Crowe was appointed Director of the Speech and Hearing Center the summer of 2008, and three instructor/speech-language pathology supervisors, Stephanie Beebe (returned), Amanda deVera, and Lisa Fratesi Ivy were hired, as a result of increasing enrollment in the undergraduate and graduate programs. Also in 2008, Melanie Randle’s status changed from full time to contractual and she eventually resigned from the department in 2010. During the 2009-2010 academic year the graduate program increased enrollment to 46 students (i.e., 44 full-time and 2 part-time). The 2010 “Excellence in Promoting Inclusiveness in Graduate Education Award” was awarded to the department from the Graduate School. In May, 2010, twenty students graduated from the master’s program. July 1, 2010, Dr. Gregory Snyder was awarded tenure and promotion to Associate Professor. The 2010-2011 Academic year brought continued growth to the program. Twenty-six first year students were accepted in the master’s program bringing the total number of graduate students to fifty-two. In September, 2010 Dr. Lennette J. Ivy applied for tenure and promotion to Associate Professor and Dr. Carolyn W. Higdon applied for promotion to Full Professor. The program participated in a site visit by ASHA’s Council on Academic Accreditation, in October of 2010. The final report received in the spring of 2011, awarded the program (re)accreditation for eight-years (i.e., until 2019). Carolyn Higdon served as president of the Mississippi Speech-Language-Hearing Association (MSHA) during 2011. In March, 2011, faculty members from the department responded to the call to serve on the Speech Language Therapist Licensure Task Force, to address the needs of bachelor level clinicians working in the public schools of Mississippi. During the May 2011 graduation ceremony, twenty-five students were awarded the Master of Science degree. In July, 2011, Dr. Carolyn Higdon was promoted to Full Professor and Dr. Lennette Ivy was awarded tenure, promoted to Associated Professor, and a change in status to Chair of the Department of Communication Sciences and Disorders. At the end of summer 2011, Dr. Laura “Lollie” Vaughan resigned from the University, but served as an adjunct professor during the fall 2011. Beginning the 2011-2012 academic year, twenty-six new graduate students were admitted, and the program began a national search for an Assistant Professor. The consistent growth of the graduate program brought increased challenges in managing the clinical needs (i.e., both on-site and off-site) of the graduate students. To support the Director of the Speech and Hearing Clinic in facilitating the clinical experience for the students, Dr. Rebecca Lowe was appointed Co-Director of the Speech and Hearing Center in August, 2011. Dr. Gloria Kellum, Professor Emeritus was a 2011 Honors Recipient at the American Speech-Language-Hearing Association’s annual convention in San Diego, CA, in November. In an effort to update alumni about the department’s activities and achievements, the inaugural issue of the newsletter, The George Gazette was launched. Like the graduate program, the undergraduate program continued to grow over the years. As a result, the department added four adjunct instructors in 2012-2013; Verda Taylor, Darlene Washington, Mia Kimmons, and Monty “Beth” Eddleman to assist in accommodating the needs of the undergraduate program. Dr. Haley Messersmith joined the team of audiologists in the Speech and Hearing Center and Dr. Robin Edge joined the graduate faculty as an assistant professor. The fall of 2012 brought a deviating lose to the department with the tragic death of Sarah Wheat and her brother John. Sarah was a first-year graduate student, who was approximately three-months into her graduate studies. During the 2013 annual conference of the Mississippi Speech-Language-Hearing Association, Carolyn Higdon received the Honors of the Association Award. During the 2013-2014 academic year many exciting things occurred in the department. A computer lab was established in the graduate students’ work room. With an in-house server and the use of the in-house computer lab, clinical reports generated by students remain confidential, and HIPAA Compliant. The department received a faculty line, and a search resulted in Dr. Toshikazu “Tossi” Ikuta, a neuroscientist joining the faculty. The Graduate program admitted its largest class of first-years graduate students with a class of thirty-nine. Dr. Lennette Ivy was awarded a $195,023.00 grant from the Robert M. Hearin Foundation for the establishment of the Hearing Impaired, Language and Literacy (HILL) Preschool Laboratory Class. April Wallace and Jennifer Johnson were hired as the speech-language pathologists to develop the operation of the five-day a week, 3-hours a day, intensive language intervention known as the HILL Class. The HILL Class began operating on January 27, 2014. In the spring of 2014 Landon Wallis began working as an adjunct faculty. Dr. Lennette Ivy received the 2014 Honor of the Association Award from the Mississippi Speech-Language-Hearing Association. The graduate students in the 2014 graduating class established the Wheat Voice Laboratory in memory of their beloved classmate, Sarah Wheat. This academic year ended with the departure of Dr. Robin Edge. In 2014-2015 Joyce Pride joined the department as the clinical records clerk. An unexpected medical emergency resulted in hiring four adjunct faculty to cover course during the fall of 2014. Those faculty members were Dr. Frank Boutsen, Brigitta Bowen Walker, Julie Carr Chadwick, and Susan McPhail. Kati Pittman was hired as a speech-language pathologist in the HILL Class, which was refunded by the Hearin Foundation. Amy Livingston was hired as a part-time undergraduate instructor. George Hall was made accessible to graduate students 24-hours via the installation of an I.D card reader on an exterior door. Rebecca Lowe began serving MSHA as president-elect. In May 2015 forty-two graduate students completed the master’s program. In 2015-2016 two new PhD faculty joined the program, Dr. Kara Hawthorne and Dr. Susan Loveall. Ronda Bryan joined the department as a part-time instructor of ASL courses. The Transition Class, an extension of the HILL Class began operating. The 2015 Fall Institute kicked of the program’s 50th Anniversary Celebration. The department also celebrated the career of Dr Lennette Ivy, who retired in the spring of 2016. In 2016-2017 academic year, Dr Teresa Carithers served as interim department chair. The following year, Dr Anne Michaels served as visiting department chair, and Dr Davis Henderson joined the department as assistant professor. In the summer of 2018, Dr Vishakha Rawool joined the faculty as professor and department chair.